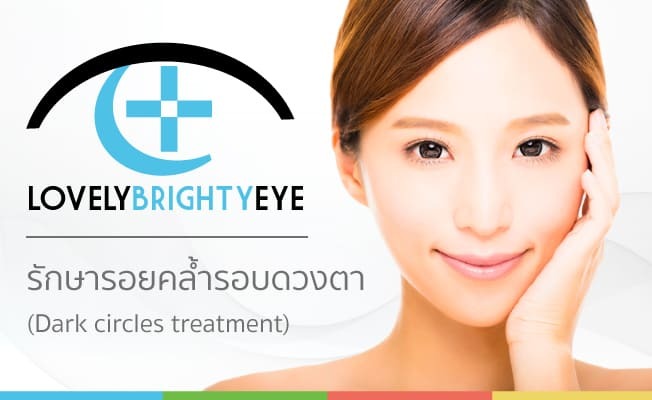 Lovely Bright Eye is reducing dark circles under eyes program created by the specialized dermatologists at Lovely Eye and Skin Clinic which evaluate eye problems and solve directly. 1. Allergies , nasal congestion can dilate the blood vessels that drain from the area around your eyes, causing them darken. 2. Hereditary, dark circles under the eyes can appear more than other parts. 3. Eye sags, causing dark eye bags. 4. Skin pigmentation is more visible. 1. Laser treatment to destroy some of the melanin. 2. Laser treatment to destroy blood vessels that discolor the skin around your eyes. 4. Eye care to make eyes moisture. 5. Eye treatment by using vitamin. 7. Avoid from eye rubbing and pressing by glasses. 8. Take enough rest and drink much water. Before the treatment, the doctor will let the patient wear special contact lenses to protect eyes from laser beam. Evaluate personal eye problems for appropriate treatment with RF which takes 10-30 minutes. After the laser treatment, the medical assistant will use vitamin treatment for eyes. Laser treatment is continuously taken every 3-4 weeks , about 5-10 times. After the laser treatment, you can go back to your normal routine. Do wear glasses when you go out. During the treatment, change your habits that can affect dark circles under eyes.